Yes the fall season is here and with come the so many options for Fall Fairs and Festivals in the Boston Area for 2011. 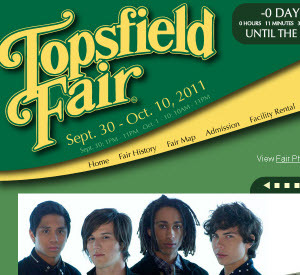 This year we want to spotlight the Topsfield Fair which includes some popular musical acts particularly for the kids. This fair has been an annual event since if you can believe it 1818! Some of the good things about the Topsfield Fair are the amount of activities that are part of the experience. This can also be a challenge though that requires some planning. The fairgrounds are pretty big so you need to make sure you plan your visit well. Printing the map beforehand and looking to see what acts are playing for your day is advised. There are 9 musical acts that will be performing throughout the fair at the Grandstand including Sean Kingston on October 6th. Mike Posner and All Star Weekend of Disney fame will be the “major” musical acts of the fair so make sure to buy your tickets accordingly. Tickets for the concerts are sold separately. « Boston Red Sox – Oh the Pain!